Frankie Art: A New Trend? | Will My Dog Hate Me? 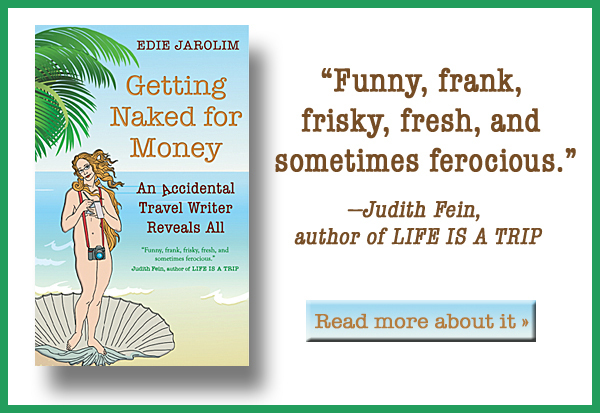 Last week I was thrilled to be able to show you the wonderful gift of Frankie art I got from AJ Emm. Then on Saturday, I was totally blown away to find a box with another artistic rendition of Frankie — this one a small wire sculpture, a surprise gift from my wonderful niece Rebecca. 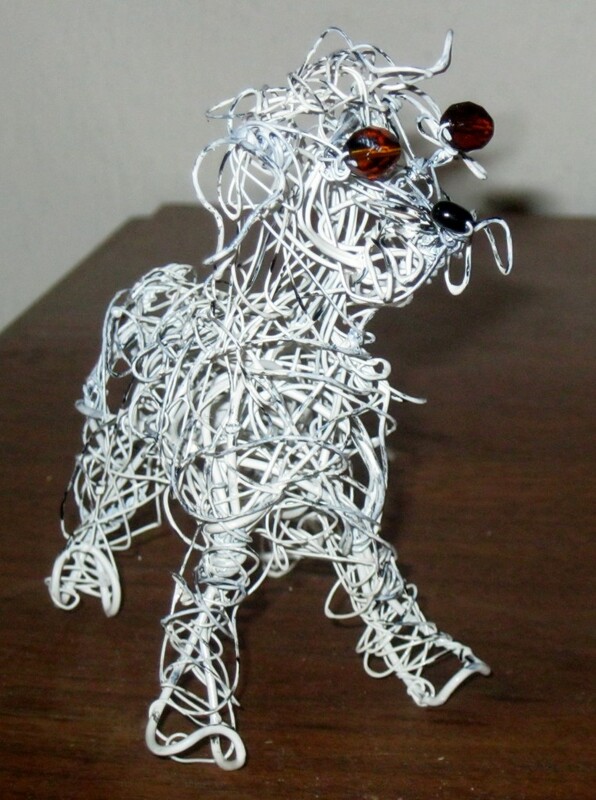 It was created by WireArtInk, “whimsical animal art sculpture by Antonia,” as the Etsy description puts it. Although it’s somewhat abstract, it really captured Frankie — I think it was the splayed feet stance, as well as the ears and nose. Frankie was already immortalized on a greeting card, cocktail napkins and refrigerator magnet, he was in a video, and now he appears in digital art and sculpture. I think Frankie Art is definitely a trend. I’m not surprised that he continues to inspire. He was one stellar pup. And here you said the Muse had retired. Instead, he is going on to inspire, if not the world,, at least the world of dog art! I suppose I should have predicted it! PS The nose is perfect. Wire is the perfect medium for terrier fur. Will there be a traveling Frankie art show? Re: The terrier fur — you’re right. And what a good idea to take Frankie art on the road! That is a remarkable sculpture. I love the eyes. Fabulous rendition! Those eyes and splayed legs. Oh my. So essential Frankie. Maybe Peter Max is next? Or Frankie on a can of Campbell’s Soup. Warhol cannot be far behind. I agree with the others. This captures The Real Frankie. Well done! 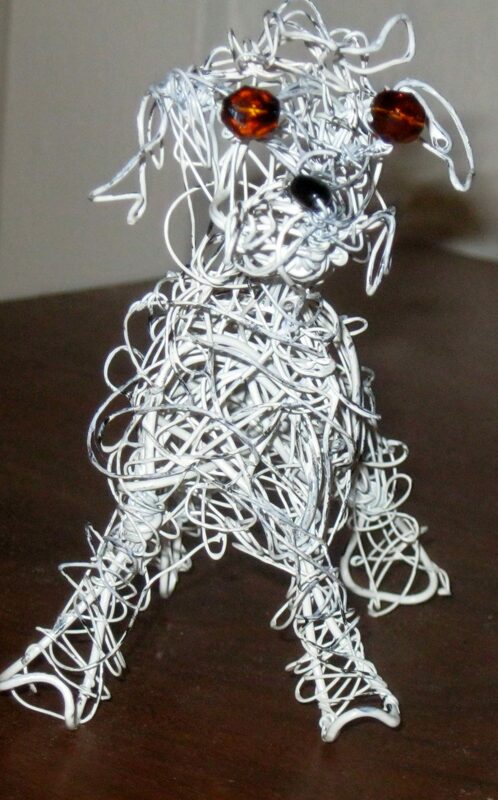 I love the wire sculpture, it’s so unique, what a thoughtful gift! I, for one, would be thrilled if Frankie Art became the next big thing. What a lovely way to honour him. I looked back at AJ Emm’s portrait of Frankie, too – wow. He really left a legacy for you to share. Rock star Frankie! Wonderful Frankie continues to inspire, wonderful people are so kind.